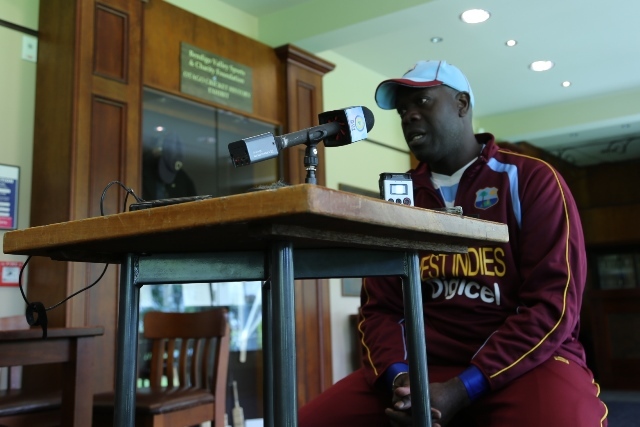 [www.inewsguyana.com] – West Indies captain Darren Sammy and Head Coach Ottis Gibson said they are looking forward to the three-Test series against New Zealand over the next month. The first Test opens on Tuesday at the intimate University Oval in the second largest city in the South Island of New Zealand and the principal city of the Otago Region. Sammy said the quick turnaround from India, where the Windies spent the last month, and getting used to the temperate conditions in New Zealand will pose a challenge. “It’s the life of a professional sportsman,” said Sammy. “One minute, you are in the hot and crazy fan atmosphere of India, and the next day, you are in New Zealand, Dunedin, where the breeze can blow you off your feet. We won’t make any excuses. We will have to come and hit the ground running. He added, “But we have our own ideas and we have come here to play good, competitive cricket. People might say India did not go well for us, but this is a new challenge, a new chance to focus and finish the year on a high. On the challenge facing the side, Gibson said, “The toughest thing will be getting accustomed to the weather. It’s not something that we encounter every day in our travels around the Caribbean, and India as hot and humid, so it will be a mindset thing. The cricket will be the same, but the mindset to overcome the weather will be our biggest challenge. West Indies have won just one series win in New Zealand in the last 50 years, when Courtney Walsh’s side led them to a 1-0 victory in a two-Test series 18 years ago. Gibson arrived on Saturday from Perth, where he accompanied Shane Shillingford and Marlon Samuels to the independent testing, after they were reported for suspected illegal bowling actions during the second Test against India last month.